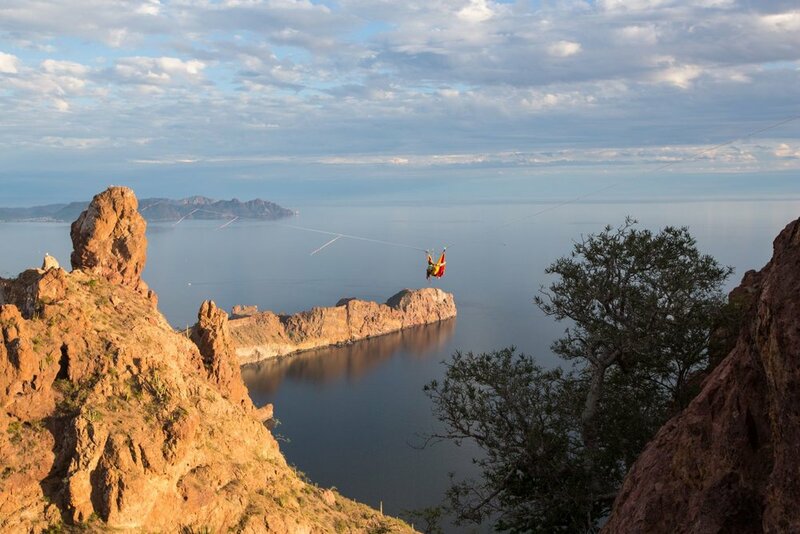 Together with my team colleagues Johannes and Clemens I rigged a 250-meter-long highline at a height of 100 meters at the Cerro Tetakawi in the Mexican state of Sonora near the border to California. When we had finished, the stunt pilot Kirby Chambliss flew below the line while I was standing on it. After the first flights for getting a feeling he even flew around and above me – in the end he flew loopings around me! I had known Kirby only because of his legendary maneuvers at the Red Bull Air Race when the Mexican agency Altuis Events approached me asking if I was interested in such a project. They showed me a picture of the location and I agreed right away. Shortly before our departure we were thinking about trying to get Kirby into the boat. We had often thought about how to combine slacklining with other sports – this idea was simply fantastic! Except for the spiky shrubs Johannes and Clemens had to crawl through to take the slackline to the other side the rigging of the line went quite smoothly. It was finished after 1.5 days. The test run felt good; on the way back I was wearing a backpack of Ticket-to-the-moon reaching the other side without falling. Funnily enough I got to send the whole line only when I was wearing that very backpack. On the day of the great action we got up very early and arrived at the anchor point of the slackline when the sun started to rise. I went onto the line and walked towards the rising sun. In the middle of the line I turned around and walked back as meanwhile the rest of the film crew had arrived. Short meeting, fixing the GoPro and back on the line at once. As soon as I was at the right spot of the line (somewhere between a third and the middle), the action started. The sound of an engine becoming louder quickly and then – swoosh – he flew through 10 meters below me. 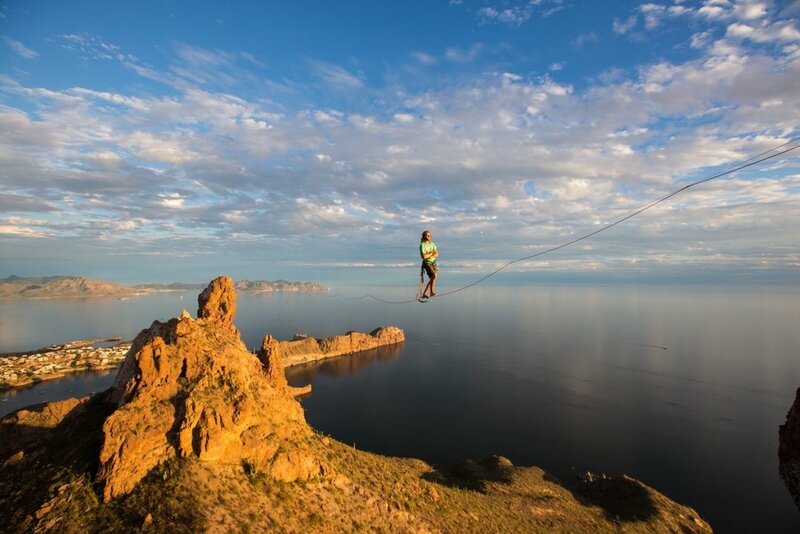 This highline also happened to be the longest highline in Latin America ever rigged so far. Many thanks to Altius Events for the invitation to this unique project. It was the first time for me to be in this wonderful country with its delicious food. I had never set foot on Latin American soil before.